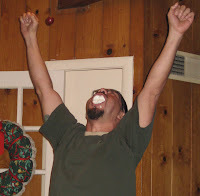 All my life my I've been told I have a big mouth - Sure I talk too much... and perhaps too loud. As a teenager, my parents tried to drill down time and time again that I'd be in half as much trouble if I just kept my mouth shut - what can I say? I like making my thoughts known... but that's besides the point. The point is... I have a big mouth. Physically. Yes. I can fit my fist in my mouth. Its not attractive, so I'll spare you that image. Once I tried and succeeded at fitting 25 whole Redvine licorice sticks wadded up in my mouth. 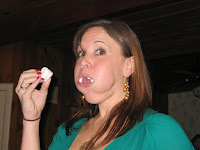 For years I've been playing and reigning champion of the game 'Chubby Bunny'... For those of you who don't know, you have to see how many marshmallows you can fit in your mouth at one time (without chewing or swalling) and still be able to say "Chubby Bunny". And then I lost. I don't know what happened... what it was. I lost to an amature; a novice - someone who had NEVER even heard of the game. One who observed my strategy and then used it against me for his win (sneaky little guy)... If it didn't happen on Christmas I would never have forgiven him. Maybe I was having trouble breathing. Maybe I was overwhelmed by the pressure. Maybe I didn't want him to lose to a girl in front of his wife and daughter - yes that's it.